Marketing Consultants Guildford Surrey building campaigns worth finding, sharing and acting on. Be Bold create interest building campaigns worth finding, sharing and acting on. An innovative website design speaks volumes about your company or product. By using the same level of creativity that we put into all our graphic projects, we will design and develop a website that has a positive impact on your specific market, helping you reach out to all your prospective clients. Our priorities when creating a website are its design, usability, functionality and attractiveness. These are all equally important to ensuring that your website works hard for your business. Be Bold can help you create the perfect content for your campaigns. From strategy to execution, we use the right words to tell your stories, make sales and create captivating reading experiences. Together, we will consider the purpose of your content: who will read it and the perception you wish to create. Then your objectives: is it to sell a product or service, or maybe to enhance your brand? Finally, your desired messages, delivery method and the responses you are hoping to achieve. We can help with your social media content writing and post scheduling. Be Bold writes your content from an agreed brief, referencing your website and researching industry news. We can also post hints and tips, trivia and share links to useful sites. Through an online control panel, you can check, edit, delete or reschedule your posts in advance. The content will be keyword rich and include researched hashtags to help promote your business on social media platforms and search engines. Demonstrate your industry authority with active, interesting social media feeds. Be Bold can help you to be seen by customers at the very moment that they’re searching on Google for the things you offer. And you only pay when they click to visit your website or call. Whether you’re looking to bring in new website visitors, grow online sales, get the phones ringing or keep customers coming back for more, Google AdWords campaigns will help. We will set up your campaign and target your ads to customers in certain countries, regions or cities – or within a set distance from your business or shop, ensuring you reach the right customers at the right time. Email is still by far one of the most cost-effective marketing channels available. We can improve the effectiveness of an existing newsletter, increasing the reach of your website content. Or help you to create new regular communications to keep your business at the forefront of your customers’ and prospects’ minds. Assisting you with building your list or purchasing high-quality data for your campaigns, we write targeted email copy and subject lines that stand out. After sending the campaign, you will receive details of ‘warm leads’ for you to follow up, helping you to increase sales with minimum hassle. Effective direct marketing requires an understanding of the customer and an appreciation of what communication will encourage them to engage. Gaining interest through creative execution is the first stage of any direct marketing campaign; helping the recipient along a journey to interaction and response is the next. A balance between cost and response to ensure maximum return on investment leads to multi-tiered campaigns utilising both digital and print techniques for optimised response. Brochures, leaflets and folders are great ways to explain your services and there’s no handier way to make a lasting impression when presenting your company’s information or quotations. Our telemarketing services include appointment making, sales generation, database verification, event invitation and market research. Our advanced telemarketing strategies are designed to maximise your sales pipeline. Your telemarketing teams goal is to understand your business so we can represent your company the way you would expect, in a professional organised manner so that we maximise on your results. To reach new customers your marketing budget should include adverts in relevant magazines, newspapers, websites, or other promotional outlets. Our creative team designs adverts to industry recognised specifications, and we produce press releases and feature writing to further add value to your marketing budget. With our extensive experience in magazine publishing we are able to advise you how to get the most for your money when investing in paid advertising. If you need flyers designing, printing, and delivering – either by post or through an e-marketing campaign – we can help. We have all of the necessary skills to support and guide you through any stage of marketing your business once you are established and looking to grow. Just get in touch, and we’ll be happy to arrange to discuss your needs. We can help you every step of the way with your events organisation, literature, designs and campaigns. Helping you to acquire new leads, turn infrequent customers into committed clients, encourage referrals, position yourselves as experts and generate press coverage. Before your event, we can help you to identify the people you want to attend your event, send invitations, and create banners, pop up stands, flyers and lead magnets. We’ll also organise any photographer and videographer attendance and plan the day’s schedule – including our attendance if you need us. After the event, we’ll help you to keep the buzz alive with follow-up communications. If you’d like to find out more about how our Marketing Consultants, Guildford, Surrey can help with your marketing, please send us an email contact@bebold.co.uk. 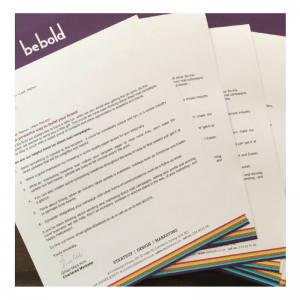 Be Bold creates personalised strategy documents that provide clear business direction. Find out about our eye-catching designs for logos, stationery, websites, literature and much more.